<br /> Keep warm through even the coldest night with these 100% Cotton blankets. Made of 100% cotton in Metro, zigzag pattern, and self binding edges. <br /> <br /> Available in 8 colors and 3 sizes. Easy care. Machine washable. <br /> <br /> Care instructions: Machine washable. Please follow the care instructions on the label carefully to minimize wrinkling and/or shrinkage. Remove bedding from the dryer promptly, press with a warm iron if necessary. Keep warm through even the coldest night with these 100% Cotton blankets. Made of 100% cotton in Metro, zigzag pattern, and self binding edges. Available in 8 colors and 3 sizes. Easy care. Machine washable. Bought the plum, and it's a nice, rich purple. The blanket is lightweight but substantial enough to not stretch out. The weave is tight. I washed it on delicate, in cold water, and dried on low. It, predictably, shrunk a small amount. Not a big deal for me, as the bed it's on does not have one of those crazy thick mattresses. If you do, you might want to size up. A great purchase, and am buying more for guest beds. Would definitely buy again and would recommend to others. Easy ordering process. Delivered in a timely fashion. Product arrived in good condition. A lovely blanket for my guest bed. My dog (a Dalmatian) naps on it as well when I am not looking. The blanket washes extremely well (no staining or shrinking) and there are no pulled threads from my dog. We just received our twin blankets, so we haven't been through a washing yet. With that said, the blankets are light and perfect for summer, or a summer house. The color is rich, deep, navy blue, which was oddly so hard to find in cotton. So they are very unique. I would buy products again. I would definitley buy this blanket again. This is the best blanket. Warm for cool nights and cool for warm nights! This is a quality blanket in every way. Couldn't be happier. 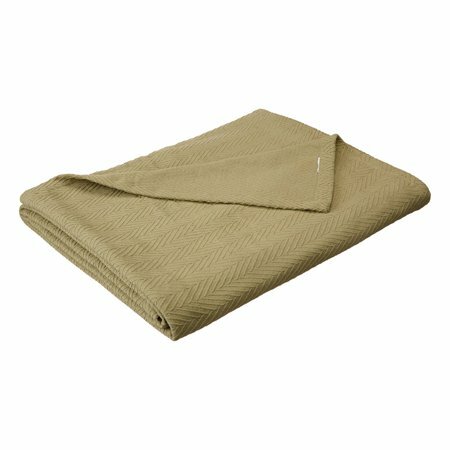 Nicely constructed lightweight cotton blanket, perfect for our Texas nights. Washed up well, and came out of dryer so soft....and left a huge amount of fluff in the filter as expected for the first wash. I'll likely buy a couple more.